It’s now time to install our prototype and put some data behind the efficiency differences we expect to see between our cooler and the factory heat exchanger. We did add a substantial amount of core surface area, so we anticipate that heat transfer will improve during a load test. Check out this shot of the Mishimoto 6.0L transmission cooler installed! We have numerous tools at our disposal to test heat exchangers. 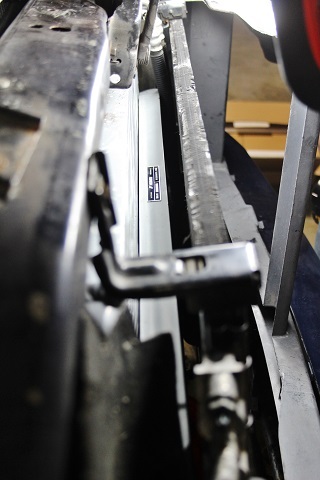 For this one, we will be using our Dynapack™ dynamometer. 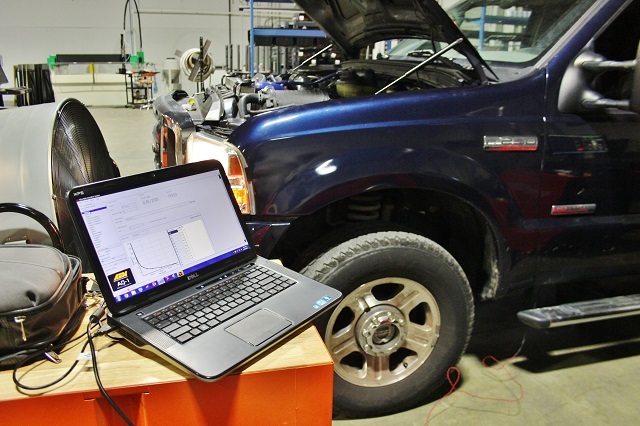 With a transmission cooler test, we want to apply some load on the vehicle to ensure that stress is created within the drivetrain. We can set the Dynapack to apply a specific load to achieve this. We then set up our truck for some runs on the Dynapack! 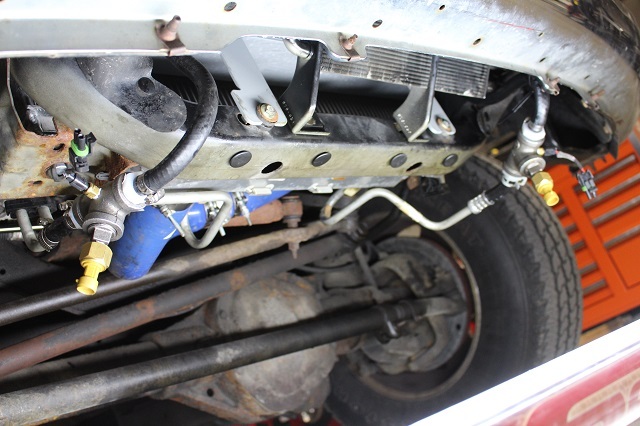 We installed pressure and temperature sensors within the transmission inlet and outlet lines. This will allow our team to evaluate the cooling efficiency of the heat exchanger. We spent a solid day testing both the factory transmission cooler and our larger counterpart. 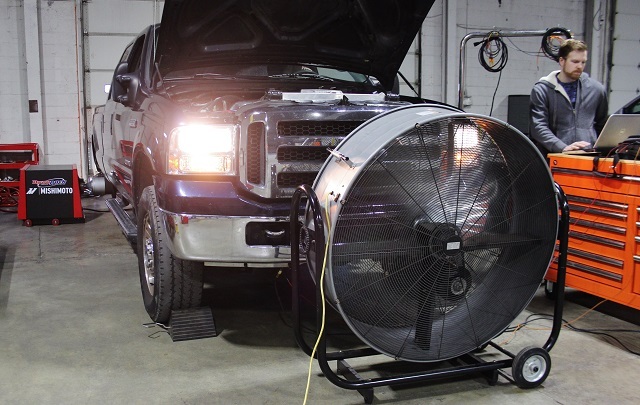 Between runs, the truck was cooled completely to ensure results were not skewed. Time to check out our results. First, let’s take a look at our temperature data. 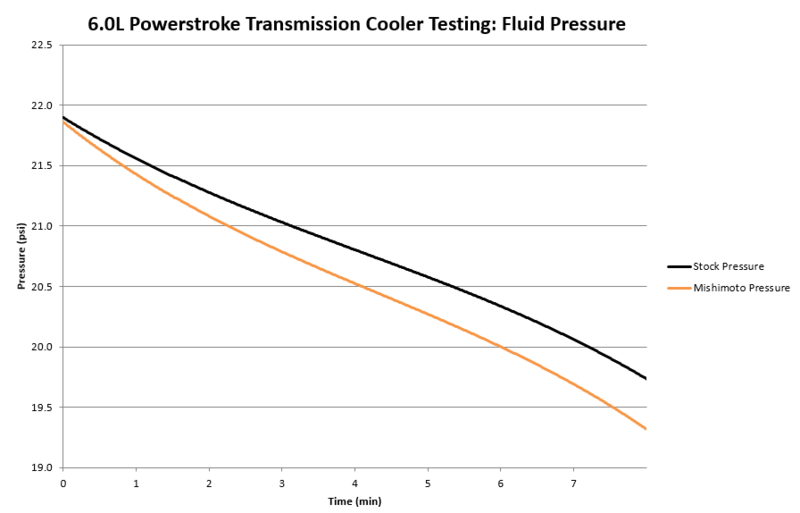 During the entire run, the Mishimoto transmission cooler kept temperatures 10–12°F cooler compared to the factory heat exchanger. The factory cooler performs well, even under this load, but we were able to produce even lower temperature numbers, making our cooler a fantastic replacement for the factory unit. With larger volume and altered tube structure aimed at heat transfer, we do expect a fluid pressure drop when installing our cooler. The pressure sensors we installed in the lines verified that the drop was not substantial. As we know, retaining fluid pressure is vital to the life of internal transmission components. 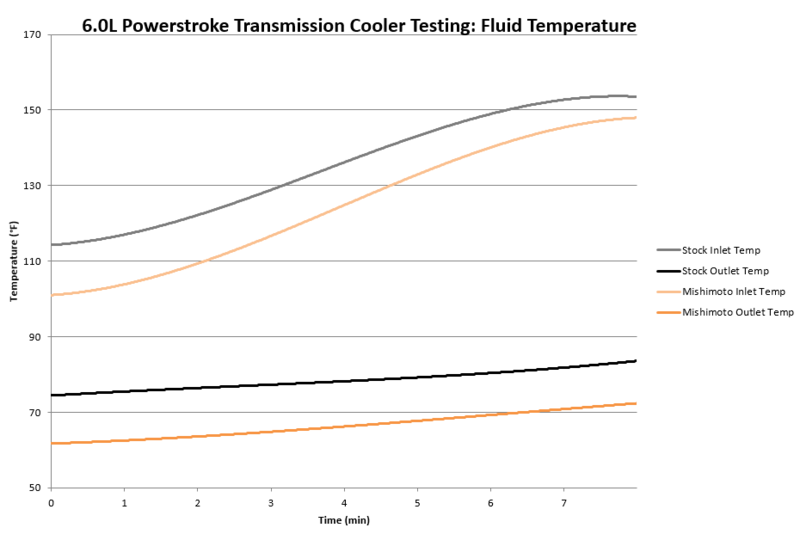 Compared to the factory transmission cooler, we saw a maximum drop of 0.5 psi, well within an acceptable range. A big portion of these gains are attributed to the increased fluid volume. 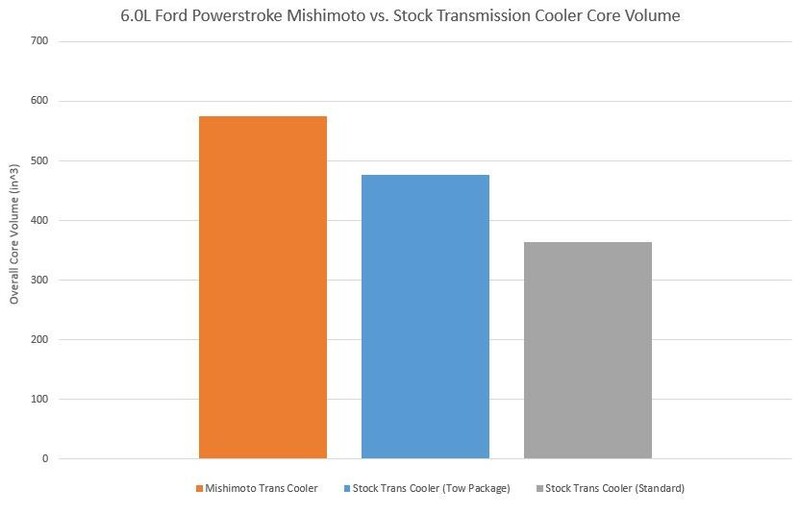 Below is a comparison of core volume between the two factory-equipped 6.0 Powerstroke transmission coolers and our larger counterpart. Our core volume is 21% greater than the factory 31-row transmission cooler! 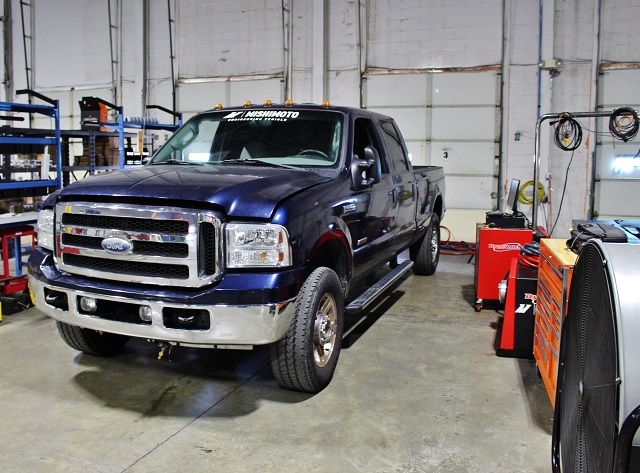 We now have a great fitting 6.0 transmission cooler that has proven to outperform the factory unit. We will be launching a discounted pre-sale for those interested in picking up this awesome cooler. Do you know when these may go on sale and about what the cost will be?